Editor’s note: Today we’re continuing our series on diversity, targeting specific questions to invite discussion and exploration of related topics. If you have a question that you’d like to see addressed, add it in the comments below! Part 4: What can organizations gain from the interactions of individuals in diverse groups? Gelaye Debebe, Professor of Organizational Sciences at George Washington University and Journal of Management Education (JME) contributor, has published a new book, “Navigating Power Cross-Cultural Competence in Navajo Land” (Lexington Books, 2012), which provides insights into diverse groups in organizational settings. To read long excerpts from “Navigating Power Cross-Cultural Competence in Navajo Land” in Google Books, click here. Hear the SAGE podcast with Professor Debebe on her JME article, “Creating a Safe Environment for Women’s Leadership Transformation,” on Management INK by clicking here. Gelaye Debebe is Assistant Professor of Organizational Sciences at George Washington University and Faculty Affiliate at the Center for Gender in Organizations at Simmons Graduate School of Management. She received her PhD in Organizational Behavior from the University of Michigan. Her research has examined how people learn in difficult or stressful environments or situations. She has specifically explored the conditions necessary to foster transformative learning among women in formal training and how individuals who represent culturally dissimilar and politically unequal groups create new knowledge through their interactions. Her published work has appeared in Research in Organizational Behavior, Journal of Management Education, Advancing Women in Leadership Journal, International Journal of Intercultural Relations, Human Resourced Development International, Issues in Intercultural Communication and Development in Practice. Up next–the conclusion to our series: How can we improve organizational management and teaching strategies to increase diversity and inclusion? Charles A. Funk, Northeastern Illinois University, and Brian W. Kulik, Hawaii Pacific University, published “Happily Ever After: Toward a Theory of Late Stage Group Performance” on November 11th, 2011 in Group & Organization Management’s OnlineFirst collection.To view other OnlineFirst articles, please click here. This article develops a theory of late stage group performance based on the late stage group’s unique characteristics: a long shared history, an indefinite endpoint, a long member entry/exit history, and a long “parent” organization relationship. These characteristics are markedly different from those of earlier stage groups, suggesting that extant literature’s limited “maintenance” or “cyclical” prescriptions are insufficient for effective late stage group management. Six propositions are developed to model the relationship between late stage group characteristics and performance. Managerial implications are also discussed and a late stage group research agenda is proposed. To learn more about Group & Organization Management, please follow this link. Are you interested in receiving email alerts whenever a new article or issue becomes available? Then click here! 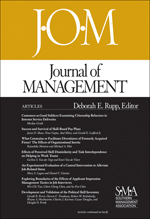 2011 Journal of Management Scholarly Award Winners! Robert E. Ployhart, University of South Carolina, published “Staffing in the 21st Century: New Challenges and Strategic Opportunities” in the December 2006 issue. Modern organizations struggle with staffing challenges stemming from increased knowledge work, labor shortages, competition for applicants, and workforce diversity. Yet, despite such critical needs for effective staffing practice, staffing research continues to be neglected or misunderstood by many organizational decision makers. Solving these challenges requires staffing scholars to expand their focus from individual-level recruitment and selection research to multilevel research demonstrating the business unit/organizational− level impact of staffing. Toward this end, this review provides a selective and critical analysis of staffing best practices covering literature from roughly 2000 to the present. Several research-practice gaps are also identified. Linda K. Treviño, Pennsylvania State University, Gary R. Weaver, University of Delaware, and Scott J. Reynolds, University of Washington, published “Behavioral Ethics in Organizations: A Review” in the December 2006 issue. The importance of ethical behavior to an organization has never been more apparent, and in recent years researchers have generated a great deal of knowledge about the management of individual ethical behavior in organizations. We review this literature and attempt to provide a coherent portrait of the current state of the field. We discuss individual, group, and organizational influences and consider gaps in current knowledge and obstacles that limit our understanding. We conclude by offering directions for future research on behavioral ethics in organizations. Michael H. Lubatkin, Zeki Simsek, both of University of Connecticut, Yan Ling, George Mason University, and John F. Veiga, University of Connecticut, published “Ambidexterity and Performance in Small-to Medium-Sized Firms: The Pivotal Role of Top Management Team Behavioral Integration” in the October 2006 issue. While a firm’s ability to jointly pursue both an exploitative and exploratory orientation has been posited as having positive performance effects, little is currently known about the antecedents and consequences of such ambidexterity in small- to medium-sized firms (SMEs). To that end, this study focuses on the pivotal role of top management team (TMT) behavioral integration in facilitating the processing of disparate demands essential to attaining ambidexterity in SMEs. Then, to address the bottom-line importance of an ambidextrous orientation, the study hypothesizes its association with relative firm performance. Multisource survey data, including CEOs and TMT members from 139 SMEs, provide support for both hypotheses. Greg L. Stewart, University of Iowa, published “A Meta-Analytic Review of Relationships Between Team Design Features and Team Performance” in the February 2006 issue. This article presents a quantitative review of 93 studies examining relationships between team design features and team performance. Aggregated measures of individual ability and disposition correlate positively with team performance. Team member heterogeneity and performance correlate near zero, but the effect varies somewhat by type of team. Project and management teams have slightly higher performance when they include more members. Team-level task meaningfulness exhibits a modest but inconsistent relationship with performance. Increased autonomy and intrateam coordination correspond with higher performance, but the effect varies depending on task type. Leadership, particularly transformational and empowering leadership, improves team performance.